When a game is talked about as having a lot in common with Lost Cities, it’s a game that knows how to get my interest. Lost Cities is a great 2-player game as there’s more depth than first expected and is one of the games my girlfriend really enjoys too. However, this kind of comparison does give Drachenherz a lot to live up to. Drachenherz is a simple, 2-player game. The board shows a very nice painting of a scene where a dragon dominates the sky whilst an archer takes aim, a princess waits to strike and a troll lurks ready to grab the princess, and so on. Each of the characters has one or more outlines around them to show where cards are placed and there are some arrows from one card location to another. Each player has an identical deck of cards and each card shows one of the various characters on each as well as a number, which is the points you will score if you have collected it at the end of the game. The winner is the player with the most points. There is also a stone dragon figure too. Whenever you take cards, you place them face-down in front of you and these will be your score at the end of the game. You’re not allowed to examine your pile during the game (probably to stop aiding any card counting). When you take any stone dragon card, you take the stone dragon figure (from the other player if they already have it) and this gives its owner a 6-card hand limit, until they lose it. After your turn, you refill your hand to 5 cards. If the 3rd ship sails (i.e. the 9 ship card in total is played), each player takes one more turn and the game ends. The game can also end if a player empties their deck. 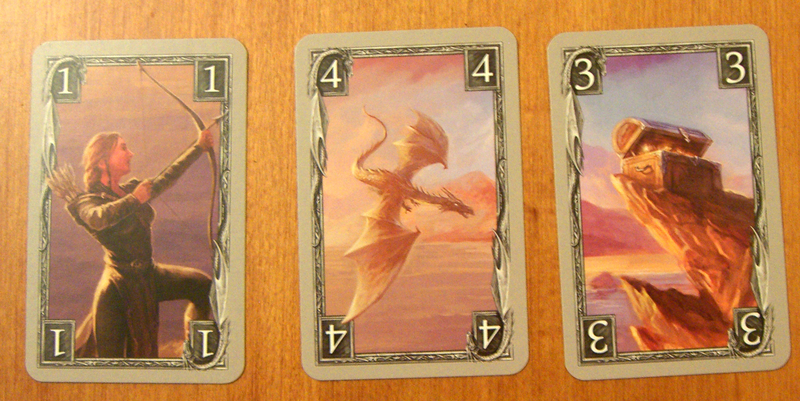 The players then add up the face-down cards in front of them and the player with the most points wins – the owner of the stone dragon gets 3 extra points and splits ties. Overall, Drachenherz is a very fast flowing game of card placement. Placing some cards may result in no gain, like if you only place the first warrior, or if you place a Fire Dragon when there are no treasure chests to collect. As a result, it seems a bit strange to start with as you’re reluctant to place anything that the other player may be able to immediately take. So, the games can start out quite cagey. However, you start to realise hand management is important. It’s easy to end up with your hand full of cards you’re reluctant to play – whether because they may be snapped up by the other player, or because they won’t currently gain you anything. Plus, you try to keep cards ready (like a princess ready to take out a high point fire dragon), or you only want to play a treasure chest when you have a fire dragon or princess ready to collect it straight after if your opponent doesn’t. As a result, you risk placing cards that might help your opponent in exchange for potential long-term gain. Also, keeping your hand fresh is important and laying multiple matching cards at once is a nice way to get some new cards into your hand. After the first few rounds, we were already playing very quickly. The arrows drawn on the board make it really easy to remember which character does/takes what. In our second game, we started to develop some tactics like trying to play specific cards at the right time (like taking the stone dragon back from the other player). Also, we started to perform calculated risks – if there is an archer card on the board and we have 3 dragons and 2 archers then it might be worth placing all the dragons at once down hoping the other player doesn’t place 2 archers before you can, so you can claim all the dragons. I think a few mind games may be possible too like putting down a treasure chest to encourage your opponent to put down a fire dragon so you can shoot it. I’m not sure yet if this predictability is possible. As you start to become more familiar with the amounts of each card in each deck, the game will get more interesting too – knowing roughly what you have left in your deck can really help you plan and you realise you really should be counting the cards a bit. Especially import to count are the ship cards as they can determine when the game ends. Each player only has 6 ship cards so one player can not cause the game to end all on their own. I think it may be better to play the game over 3 rounds where the first player to win 2 rounds wins so it’s more evenly matched, especially as it plays so quickly. The plastic dragon figure (I think the same one from Blue Moon) is nice enough but isn’t strictly necessary – a special card could have replaced this; in fact, the player currently owning the stone dragon could just place one of the stone dragon cards they played to get it face up in front of them until it was lost. 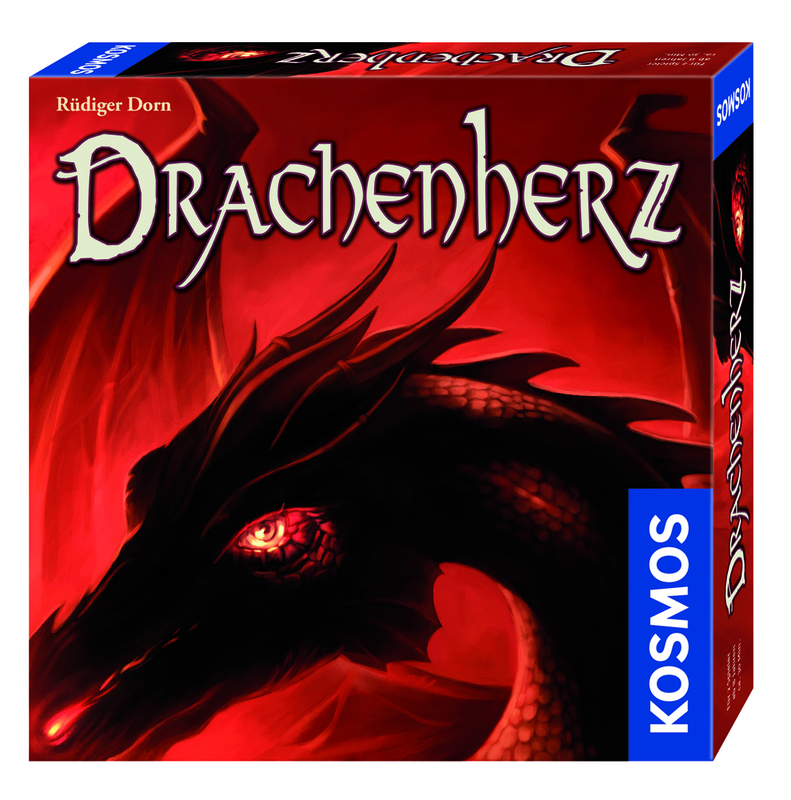 However, as Drachenherz is a low-priced game anyway, it’s an addition that probably added little extra to the price. Drachenherz may not be a deep game but it’s a fun, nice-looking filler and one that can be played with or without deeper tactics. I suspect very bad, or very good, luck in card drawing could be hard to overcome with tactics alone, but it does feel like the player has control too over their game too. I suspect it may not endure as long as Lost Cities, and it isn’t as portable (although I might make a paper fold-up board to conquer that) but I’m pleased to add it to my lighter 2-player game collection. This entry was posted on Thursday, April 1st, 2010 at 2:09 am	and is filed under Board Game Review, Board Games, Drachenherz. You can follow any responses to this entry through the RSS 2.0 feed. You can skip to the end and leave a response. Pinging is currently not allowed.